John W. Morrison, Jr., is a Partner in our Bismarck office. 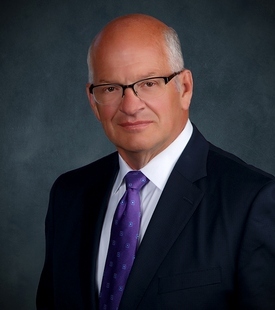 He has been a shareholder in the Bismarck firm of Fleck, Mather & Strutz, Ltd. since 1986. He practices in the area of natural resources, public utilities and commercial law, and regularly represents clients in both litigation matters in state and federal courts and before state and federal administrative agencies, including the North Dakota Industrial Commission, the North Dakota Public Service Commission, the North Dakota Tax Department and the Bureau of Land Management. Mr. Morrison received his Bachelor of Arts from Mary College and his Juris Doctorate from the University of North Dakota School of Law. Before entering private practice in 1981, he worked for the North Dakota Legislative Council, the North Dakota State Land Department, and the North Dakota Attorney General’s Office. He is a co-author of “Lobbying, PACs and Campaign Finance” (West 1996-2008), and has authored “Regulation of Gas Gathering Systems,” 39 Rocky Mtn. Min. L. Inst. 18-1 (1993); “Doing the Lateral Lambada: Negotiating the Technical and Legal Challenges of Horizontal Drilling” 43 Rocky Mtn. Min. L. Inst. 601 (1997).